Why does this officers name come up when ever a person ends up dead? Sorry but only a coward shoots someone in the back. These San Jose Police officers are failures, they failed to protect life. They hide like cowards behind a badge and image. It’d disgusting to know they go home each night after they destroyed a family and got away with murder. This is why total police have lost the respect and trust of so many people. The numbers of people gunned down by trigger happy police is in the thousands. Family and friends of a man shot dead by San Jose State University police have spoken out against a decision not to charge Officer Frits Van Der Hoek. The Santa Clara County District Attorney’s Office determined in a 46-page report Friday that Sgt. Michael Santos acted in self-defense when he shot and killed 38-year-old Antonio Guzman Lopez in early 2014. The incident was caught on video by police body cameras. The DA released stills of the footage, though the family and authorities disagree on the context of what they depict. Police say Santos and Officer Frits Van Der Hoek responded to a report of a man armed with a knife the morning of Feb. 21 last year. “I was just over by the print shop and there’s, like, a bum over there with some sort of knife, like, stabbing the air and doing a bunch of crazy stuff,” a student told a 9-1-1 dispatcher just before 11am, according to the DA’s report. Santos was the first to arrive on scene, at East San Salvador and South Eighth streets, and he was trailed in a separate patrol car by officer Frits Van Der Hoek. Lopez, according to the official summary, was walking near the university campus with a foot-long sawblade used for cutting drywall, “acting as though he was mentally unstable or intoxicated.” When the two officers parked, Lopez slumped onto his knees. Santos left his patrol car with gun drawn. Officer Frits Van Der Hoek approached from behind, as shown by stills from his body camera. SJSU police Chief Pete Decena, while declining to comment on the coroner’s report Lopez Guzman was shot twice in the back, revealed that the two police officers involved — Sgt. 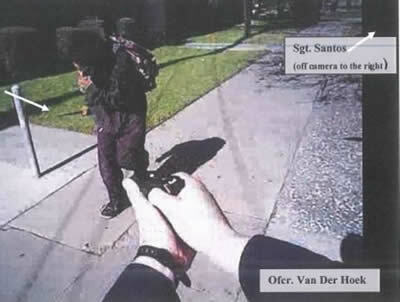 Mike Santos and Officer Frits van der Hoek — were both wearing uniformed-mounted cameras. He would not say what the cameras recorded. “Sgt. Santos and Officer van der Hoek responded heroically in a very difficult situation, ” Decena said. Obvioulsy the accounts of the officers is not totally acurate because the man was charging them as they claim why was he shot in the back?